So a friend asked me to recommend products that can both grow hair and make it thicker. This seems to be a very common question for people with both natural and chemically treated hair. My answer to this question is that there is no one product that can miraculously grow or thicken hair. It’s more of a regimen and ensuring that you properly care for your hair. Hair grows about 1/4-1/2 inch per month. Anyone who has had their hair chemically treated can attest to this. It’s the reason why we need a touch up every 6-8 weeks. We may not see this growth as expected because the ends break off as fast as we can grow it. This is usually due to lack of moisture. As for thickness, the same thing that works for moisture works for making the hair nice and thick! Mayonnaise and egg treatments contain lots of protein. You may want to try the treatments weekly until you feel your hair is stronger. However, be careful and pay close attention to your hair. There is a such thing as too much protein and you want to maintain the proper balance for your hair. Another important thing to note is that our diet and fitness regimen impacts our hair as well. Getting in 8 glasses of water a day will help with keeping the hair moisturized. A healthy, well-balanced diet and regular exercise also contribute greatly to your overall health, including hair health. Lack of protein in a diet can lead to limp, dull, thinning hair. I normally blow-dry in stages. I do this for my own hair as well as Kaycie’s. I wash the hair, using only non-silicone shampoo. I like Dr. Bronner’s Magic Soaps Pure-Castile Soap mixed with water. I condition with Olive Oil or Le Kair Natural Olive Oil Cholesterol Creme . After I am done, I will detangle the hair in four sections using my Shea Butter mix, a wide tooth comb, and a large Bristle Paddle Brush . 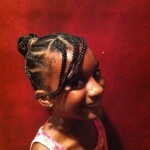 I braid the hair in the sections to let it air dry a little. After the hair is at least 80% dry, I will start the blow drying process. I like to part small sections beginning in the back. I part the hair, add Grape Seed Oil for protection from the heat, and I start to dry the hair using the concentrator piece and the big paddle brush. It’s important to have a good hair dryer and some patience. I brush with the dryer on medium, pointing at the hair section I am holding taut with the brush, until the hair is relatively straight and 100% dry. I brush, holding the hair as shown in the picture, and run the hair drier up and down the same section a few times before moving to the next section. 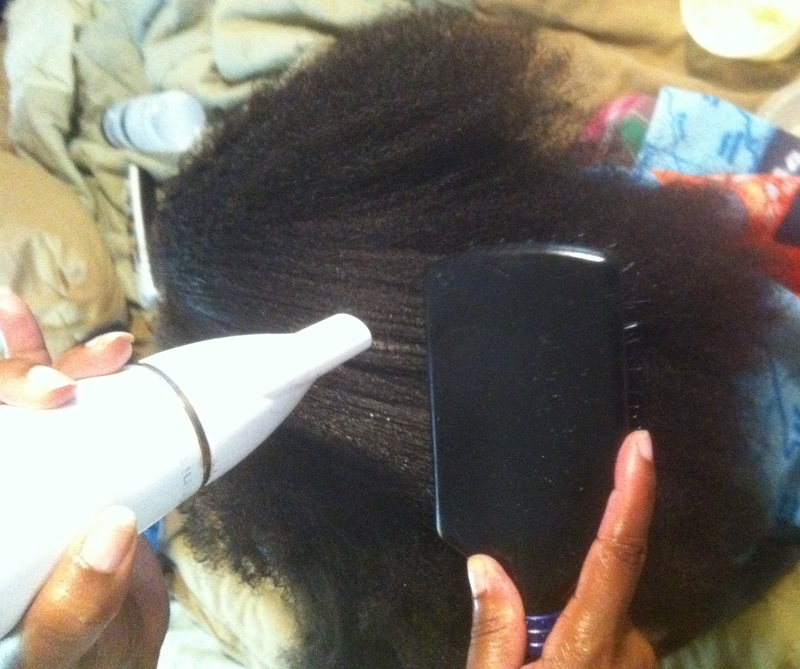 The tension provided by using the brush enables the hair to stretch out easily. I continue this way until I am done with the entire head. Some naturals call this the tension method. You can achieve the same result using only your hands to pull the hair taut. I like the paddle brush, but using the brush means you really need to ensure that you detangle the hair properly so that the brush doesn’t rip it out as you are brushing. Let hair dry a little before blow drying. Never blow dry soaking wet hair. The more you let it hair dry, the less heat you will need to use, and the less damage you cause. Use a heat protectant. I like a natural heat proctetant like Grape Seed Oil . It resists heat up to 425 degrees (F). Invest in a good hair dryer. Don’t rush! Take your time no matter how thick or dense your hair may be. Mistakes due to pulling the hair or using too much heat are not easily repairable and may entail cutting the hair. A bad place to be just because you weren’t careful or patient. Don’t blow dry too often. Heat is harmful to your hair no matter how careful you are. Try to limit as much as possible. There are other ways to stretch the hair that I will discuss in a later post. I have found the best hair product ever!!! I was struggling with keeping my hairstyle after working out . This was particularly difficult when I decided to wear my hair straight. I don’t straighten often, but when I did, I couldn’t exercise in order to keep the style. I knew that there had to be a solution. I researched and tried many things. 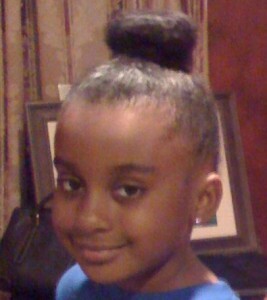 I wrapped my hair, put it in a tight ponytail, wore a bun, wore a headband, wore a bandanna. You name it, I tried it. But nothing seemed to work. A few weeks ago while surfing online, I came across some message board where someone mentioned this mesh cap. I didn’t believe that this could work, but I figured it couldn’t hurt to try. I had just been to the salon and was sporting the straight look. I wasn’t exercising and the guilt was killing me, so I made the purchase. I waited until I was ready to give up the straight look before putting this to use. I was about 3 days into the hairstyle when I tried this. I wrapped my hair tight and made sure that none of my hair was touching my skin. I did a session of TurboFire and if anyone has tried it, the routine is very intense and I was sweating profusely after. I was convinced that my hair was a gonner. WRONG! I took down my hair and, although it wasn’t as straight as when I wrapped it (turns out I didn’t spend enough time making sure the back of my hair wasn’t touching my skin), my hair was basically still straight. I wrapped my hair that evening, sprayed some oil sheen on it, and tightly wrapped my stretchy silk scarf. The next morning, my hair was perfect! I wore the style for 3 more days and exercised once more. When I decided to wash it out, my hair was still straight. The only reason I couldn’t keep the style was my hair badly needed a wash! Miracle product. No more excuses. New hairstyle no longer means no exercise!! It also works for those with relaxed hair. What Are Protective Hair Styles? Protective styles are styles that keep your ends shielded from the various weather elements (wind, rain, snow, sun, etc.). These styles require no direct heat and no additional manipulation of the hair outside of the original styling. If done correctly, protective styling can to help retain moisture, prevent split ends and breakage, and cause less stress to the hair from constant combing, brushing, and styling. These styles are particularly useful for people with shoulder length hair. Once the hair is shoulder length, the ends of the hair tend to brush against clothing which causes a great deal of breakage. There are many benefits to wearing protective styles. One major benefit is healthier, longer hair. Hair is healthier and can grow longer due to the fact that the hair is protected and not manipulated daily. Another benefit is the ability to spend less time on the hair on a daily basis. Protective styles usually require one styling day and the styles usually last anywhere from 1 to 4 weeks. True protective styles can also result in a reduction of acne that often results from hair and hair products coming in contact with the face. Lastly, some people just enjoy the look and the variety of protective styling options. It is important to remember that even protective styles can cause damage if not done correctly. It is vital to be very careful whenever handling your hair, even if you are only handling it every so often. Never pull the hair and pay close attention when detangling. Many protective styles, such as twists will require extensive detangling when it’s time to remove them. Also, while buns are considered the ultimate protective style, there are some things to take into consideration when choosing this style. First, consider the length of your hair. If your hair is a length that the ponytail holder will sit on the ends of your hair, buns may not be the best style until the hair grows out more. Secondly, hair needs a break even when in a bun. Switch up the style every so often. At least, switch the location of the bun. Breakage can result if the bun is worn in the same location every time. Protective styles are fantastic styling options and promote healthier, longer hair. They look great, are easy to create, and give us a break from daily hair styling. Andre Walker, famous hairstylist to Oprah, designed a hair classification system for curly hair types that is used across numerous hair boards and blogs. Knowing your hair type can help you to choose the right styling and hair care options. This hair type refers to hair that forms the shape of an S and sticks close to the head. It has three sub types that detail the texture of the curl. 2a is fine, 2b medium textured, and 2c is coarse. Hair type that refers to curls that are well defined and springy. This hair type has lots of body and is easy to work with whether its straightened or styled in its natural state. It also has sub types. 3a curls are big and loose, 3b curls are medium and range from medium ringlets to tight corkscrews (sharpie size), and 3c curls are very tight corkscrews (pencil or straw size). This hair type refers to hair that is tightly curled with a visible curl pattern. It includes 2 sub classifications. 4a curlies have curls that form an S pattern and 4b curlies have curls that form a Z pattern. You can tell which one you are by pulling out a strand of hair and examining the curl. In terms of this classification, I have a few types throughout my hair and that is actually very common. I am 3c in the top front, 4a in the middle (this is the majority of my hair) and 4b in the very back left side of my hair. Visit Naturally Curly Hair Types for more about this classification and examples of each hair type. I find that I found out more useful information by using the old fashioned way of analyzing and learning more about my hair type. This involved understanding the following terms and really thinking about my hair and its behavior. Review How to Analyze Hair for more information on this process. I find that I found out more useful information by using the old fashioned way of analyzing and learning more about my hair type then using the classification system. Analyzing your hair is helpful when finding styling options, caring for your hair, and choosing the proper hair products. This involves understanding the following terms and really thinking about your hair and its behavior. Texture refers to the diameter of each hair strand. The different hair textures include fine, medium, coarse. Fine hair is extremely soft and silky. It can often have difficulty holding a curl. Medium hair texture is the most common. There is a wide range of styling options for this hair type. Coarse hair has a rougher feel, is on the heavier side, and tends to grow both outwards and downwards from the scalp. I am just noticing my hair growing downwards as it has gotten longer. For a long time, it just grew out. Hair density refers to the number of strands in your hair. It is usually found by courting the number of strands in one square inch of the scalp and is unrelated to texture. It is often defined as thin, medium, or thick hair. Thin hair lacks volume and looks well with blunt cuts or styles with curls that give the illusion of volume. Medium hair is neither thick nor thin as the name suggests. Numerous styling options are available for medium hair and can include styling it to look thinner or boosting up the volume. Thick hair tends to have a lot of volume and looks great with layered styles. Density can also dictate which products we use. Often products will indicate if they give or minimize volume. Another thing to note is hair density decreases as we age, so styling options will have to be reconsidered. Hair porosity defines how well the hair absorbs moisture. Overly porous hair release moisture easily and is dry and easily damaged. Apple Cider Vinegar treatments work well to treat overly porous hair. You can check the porosity of your hair by feeling it when dry. If it feels rough and tangles easily then it is overly porous. You can also test by taking a few strands of hair, one from the back, top and sides of your head, and dropping them in a bowl of water. If they sink in less than a minute or two, then your hair is overly porous. This refers to how well the hair stretches and returns back to its normal state. Hair should be able to stretch up to 50% of its original length without breaking. You can test this by taking 4 strands of your hair from different sections while wet and stretching it to see if it returns to its original state without breaking. Normal hair with high elasticity is easy to style and work with. Hair with low elasticity is more difficult to work with and has difficulty holding curls. 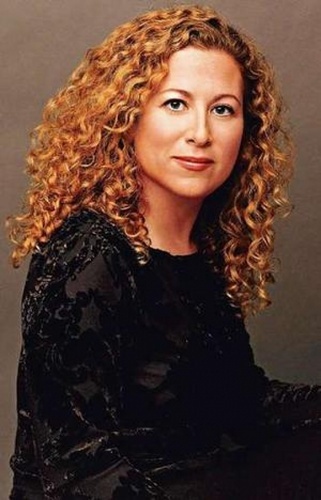 If your hair is not “curly” as I often hear, it very well may be due to an elasticity problem. Over processing and excessive heat styling are common causes for low elasticity. The treatment I describe in my current monthly hair regimen is helpful in repairing elasticity. Wave pattern just refers to the look of your hair. Hair can be straight, curly, very curly, or coiled. Healthy hair can have any of the patterns or even a combination of patterns in many cases. Hair with no wave is straight. 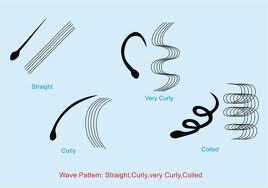 Curly hair has a wave and forms a C or an S shape depending on length. Very curly hair has an S or a Z pattern and can be bushy when long. Coiled hair forms a spiral and grows out from the scalp. The spirals can be tiny or finger sized. As you can see, hair is very complex. It is useful to analyze hair in order to choose perfect styling and product options. It also helps so that you are aware of any damage that needs to be repaired. It is essential to understand that hair types differ as much as individual personalities differ. You should work to understand what works best for YOUR hair. This is an ongoing process that will not be resolved easily.